It seems QR codes have popped up everywhere over the past few years – on coffee cups, t-shirts, sides of buildings, and one of our favorites: QR codes on cookies. These jumbled-looking squares have gone totally mainstream when it comes to marketing. QR codes are scannable by smartphones – which more than half of all Americans own. For the first time in history, people use smartphones more than landlines or any other mobile devices. It means that by using QR codes, you can reach customers wherever they are, and you can take them exactly where you want them to be online. Think about your online presence right now. Your business has a website, blog, newsletter, social media accounts. Wouldn’t it be great to drive people to those sites and get them to take action on the spot? Maybe it’s participating in a contest, registering for an event, or leaving a product review. QR codes help your business do this. They’re free to make (here’s where to create custom QR codes), and they can be used in all sorts of creative ways. Let’s do a quick review on QR codes. You’ve seen them, but what exactly are they? Well, in short, they’re computer-generated, two-dimensional images that resemble barcodes. The big difference is that QR codes can store huge amounts of data, and when scanned with a smartphone, they take people directly to an intended online location. Still not sure if they’re right for your business? Read on for three good reasons QR codes belong in your marketing. 1. QR codes can be printed on all sorts of promotional products. If you’re handing out promo items already, consider adding QR codes to punch up your promotion. As long as the items have a surface that’s large and flat enough for a QR code to be readable, they’re game. Tote bags and t-shirts make it easy for QR codes to be scanned, for example, but smaller items such as pens or license plate frames won’t work quite as well. A good rule of thumb is that you don’t want your QR codes to be smaller than one inch square. You want them to be readable, and you also want them to be printed where they will be noticed. 2. Social media ties in perfectly with QR codes. Want more Facebook fans? Twitter followers? Want customers to know you have a Pinterest or Instagram account? Take customers and prospects directly to your social media sites with QR codes. People are already using their smartphones to check their social sites. QR codes make it easy for them to find your company’s social presence. They can scan the codes and go directly to your social sites instead of having to look up your company or key in a URL. People aren’t interested in spending a lot of time tracking down your company’s various sites. QR codes make it simple and fast. 3. QR codes generate huge exposure for your marketing content. Add QR codes to your business cards, marketing materials, promotional products – whatever you’re distributing to your customers – and take them directly to your marketing content. If your company is producing any kind of content, you want to get as many eyes on it as possible. People may forget to look up your blog or access your white paper later, and that’s where the magic of QR codes comes in. They’re instantaneous. They immediately take customers to your blog, e-book, podcast, presentation, video – whatever content you’ve created for your audience. The technology is there for you to kick your marketing up a notch. QR codes are free, easy to use, and best of all, they’re immediate. There’s no keying in a URL or remembering to take action later. QR codes allow you to link customers to specific online destinations right there on the spot. 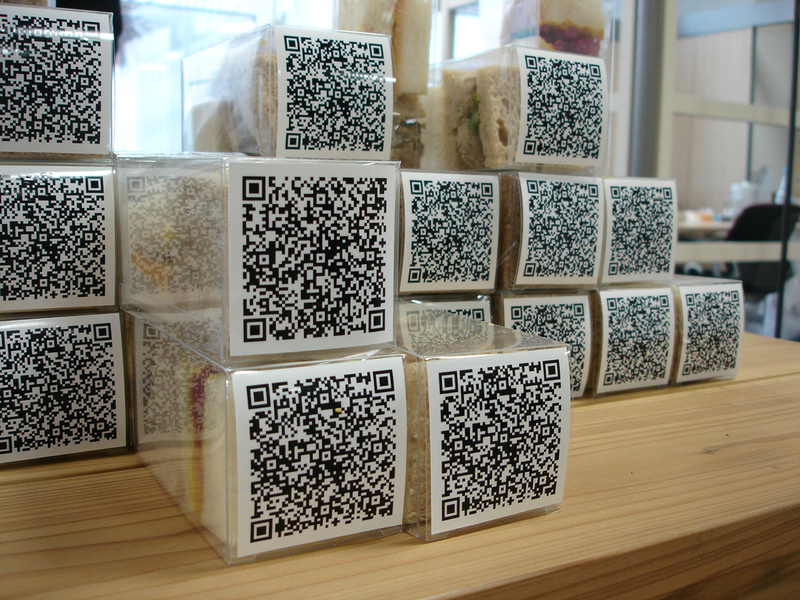 They can scan a QR code while they’re waiting in line, browsing your shop, or enjoying lunch. And it comes so naturally, too. Fifty-eight percent of Americans own smartphones, according to Pew Research, and use them continually throughout the day. The key is to use QR codes smartly. Make it worthwhile for people to scan them, and make sure they link to quality content. Don’t use QR codes just to use them – find a creative way that engages your target audience and brings value. Have you ever used QR codes in a promotion? Tell us about it! Use QR Codes At Your Next Tradeshow or Conference!